Everyone wants to go on the family vacation of their dreams. Whether it’s you and your partner, your kids in tow, or joining another family on the road, finding the right family-friendly destination isn’t always as easy it should be. You want somewhere comfortable, quiet, and that offers activities for you or your kids to take part in during downtime. Depending on what you do during the day to wear yourselves out, you want to come back to the comfort of your RV and relax for the rest of the evening. You won’t find that at every RV park and campground under the sun. 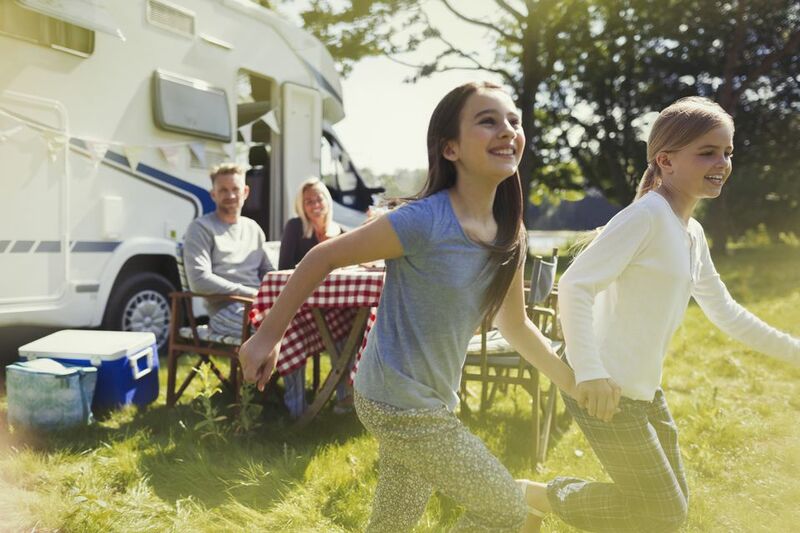 Here are seven of the best RV parks across the nation for family-friendly fun, travel, and more. There’s something here for every member of the family from visiting the beach to Disney World and everything between. What better place to spend time with the family then sunny southern California? Mission Bay RV Resort is an excellent RV park with full utility hookups, showers, laundry, free cable and Wi-Fi, a convenience store and a dog park. Don’t worry if you have a big rig as Mission Bay can accommodate motorhomes and trailers up to 80 feet. As for family-friendly activities, you don’t even have to leave the park grounds with planned events and kid-friendly activities. The park itself is situated right on the bay for fishing, swimming, and rentals. But this is San Diego, so, of course, you’ll leave the park. Great family activities include the world-famous San Diego Zoo, Legoland, SeaWorld, and much more. What do you expect from a park that calls itself Sun-n-Fun except for fun and the sun? Located on the Gulf of Mexico in Florida, Sun-n-Fun RV Resort has all the amenities you need for your vacation like full hookups, cable TV, laundry, and shower facilities, and your choice of a standard to deluxe RV sites. The grounds host events throughout the year and even themed weekends during the summer. There is plenty to do outside the park; your easiest bet is relaxing or playing around in the warm waters of the Gulf of Mexico. If that isn’t enough for you, Mote Aquarium and Busch Gardens are nearby. For something more natural take a day trip to Myakka River State Park. Michigan may not be the first place that jumps to your mind for family fun, but Vacation Station RV Resort is an excellent place for everyone. 155 manicured sites have full hookups, cable, Wi-Fi, and the park is outfitted with immaculate facilities to go along with a clubhouse and community center. There’s a heated pool, brand new playground, private fishing pond, events and activities, bike rentals, and even an arcade to keep the kids busy. Vacation Station is conveniently located next to the beaches of Lake Michigan for plenty of freshwater fun of fishing, swimming and more. There’s also Ludington State Park, Stearns Park, lighthouses, or catch a ride on the S.S. Badger. River Plantation RV Resort is next to a treasure trove of family-friendly activities situated in the foothills of the Great Smoky Mountains in Tennessee. The park has full hookups and facilities as well as two pools and a hot tub, fitness center, playgrounds, outdoor party areas, an arcade and is pet-friendly. There are loads of fun activities awaiting you in the nearby area including Wonderworks, Ripley’s Believe it or Not Museum and Aquarium, Rainforest Adventures and Discover Zoo, Adventure Park Five Oaks, and of course all the scenic hikes, bikes, and sights of Great Smoky Mountains National Park. How could we feature family-friendly RV parks without including a park that’s in the most magical place on earth? The Campsites at Disney’s Fort Wilderness have all the modern conveniences you can ask for in a forested setting nestled in the Magic Kingdom Park of Walt Disney World. You wake up, hop on a shuttle, and are instantly transported to any number of fun activities and rides Disney offers. Sites are surprisingly inexpensive as well. The grounds offer other features not found in the rest of the park including a private pool, archery, horseback riding, canoeing just to name a few. This is the best way to experience Disney. Sodom Mountain Campground is a gem of a campground for those around the northeastern part of the country in Massachusetts. You get all the creature comforts with utility hookups as well as great facilities. Those go along with the ground’s large pool and playground, game room and RV park standbys like horseshoes and volleyball. The camp has so many activities they even have a full-time activity director. The park is the closest camping area to Six Flags New England and is surrounded by over 250 miles of lovely New England hiking and biking trails. Use Sodom Mountain are your starting point to explore all lower New England offers. KOA is a popular chain of campgrounds throughout the United States, and you’re hard-pressed not to have an enjoyable time with the family at any KOA. That’s why we couldn’t narrow it down to a single campground. Most KOAs are outfitted with full utility hookups, excellent facilities, and amenities. Expect pools, spas, playgrounds, private ponds, mini golf, dog parks, arcades, horseshoes, basketball courts and plenty more. You can pick any popular destination and chances are that a KOA is right down the road. No matter the destination for your family, finding an RV park or campground as basecamp is paramount to being comfortable during your trip. Take the time to find the right family-friendly place to park your rig, explore the area, and relax when you’re not out and about trying to create memories.